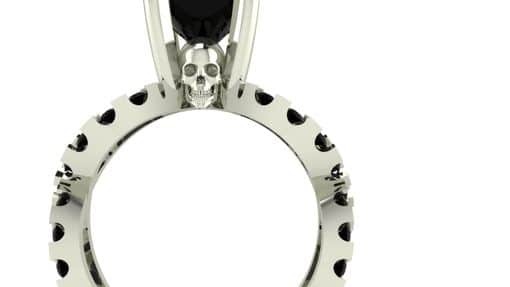 This Split Shank Skull Engagement Ring has 2 skulls nestled underneath the center stone. The french pave set stones in the band are 1.5mm, but they could be made larger or smaller. This Skull Engagement Ring holds a 7.5mm round stone, but could easily be made for other shapes and sizes. ACCENTS: Around 1/2 TCW, depending on the size of the center stone. Due to the size, these can only be Diamonds, CZ, Emerald, Ruby, and Sapphire. Are you a skull ring lover? Check 2 others HERE and HERE. 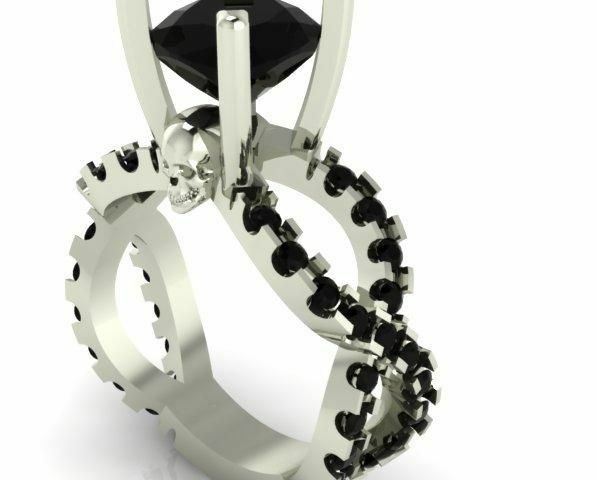 Click HERE to learn more about custom jewelry, to see our portfolio, or to contact us about a Skull Engagement Ring. It can cost less than you think to have your very own custom engagement ring made just for you. Why hassle with the retail stores for boring and overpriced engagement rings?